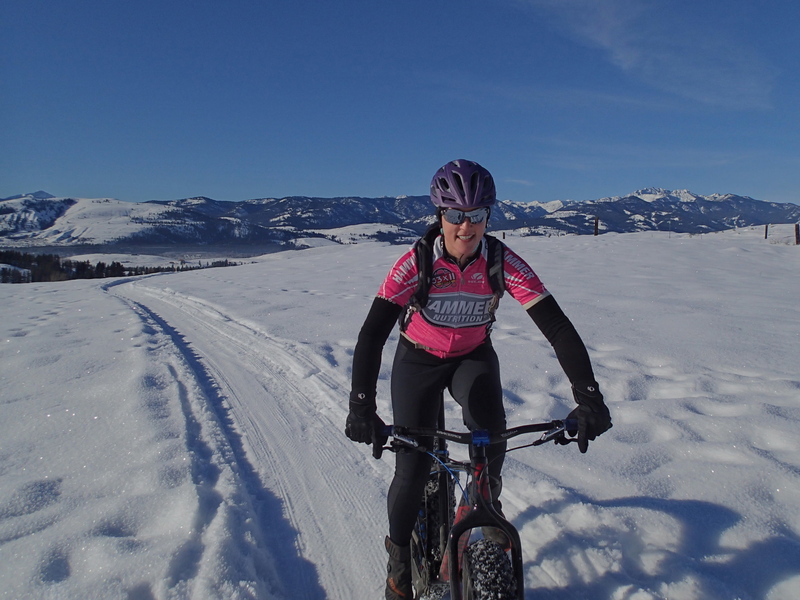 Honestly, I didn’t know what to expect about my first fat biking experience, but I certainly had some preconceived notions about what it’d be like. I figured most of my time would be spent on wide, flat groomers, the same trails that skate skiers glided over. 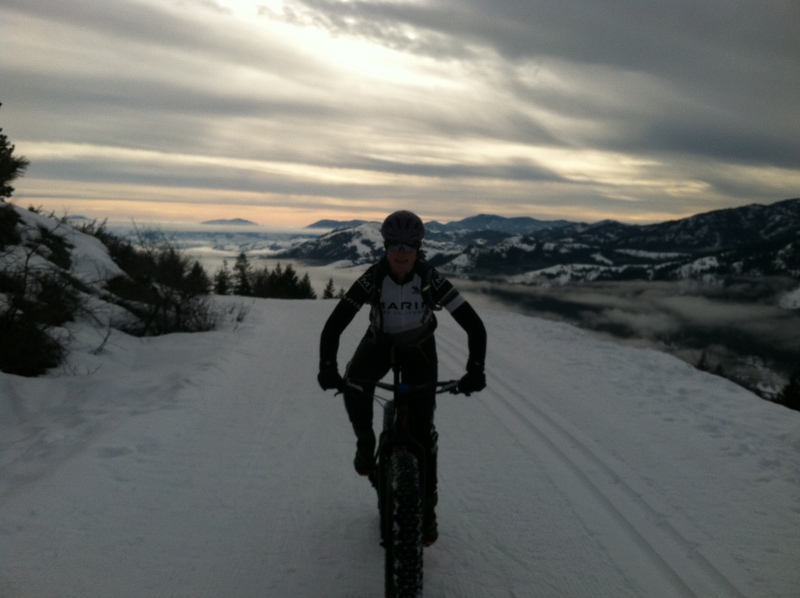 I also thought of fat bikes as heavy, burdensome beasts, difficult to maneuver and cumbersome to pedal. I also thought I’d be wearing my big, clumsy snow boots and be bundled as if I were attempting an 8000m peak, trying to stay comfortable in cold, snowy conditions, but also feeling immobilized and claustrophobic in too many layers of clothing. I also anticipated not being able to fat bike at all, since I was cautioned that there are strict rules in place to ensure fat bikers don’t damage the trails by sinking in too deeply in warmer temps. Luckily, our experience was much different than my expectations. 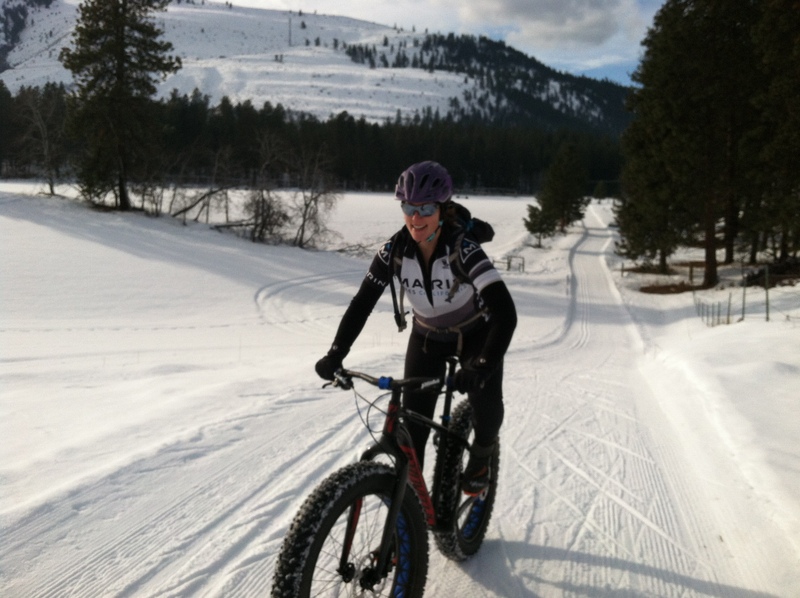 Some of the trails that we explored were, in fact, wide, groomed nordic trails open to fat bikes. The terrain itself isn’t very interesting, but it does allow you to access some beautiful views on two wheels over the snow. It wasn’t as flat as I expected either. At times, we found ourselves hunkered over the stem, driving our lowest gear to just barely get up some of the hills. And even though temps were hovering just above freezing, our tires didn’t leave more than a faint tire tread imprint. In many places, the skate ski tracks cut deeply into the trail while our 4.5″ wide tires actually smoothed it out. 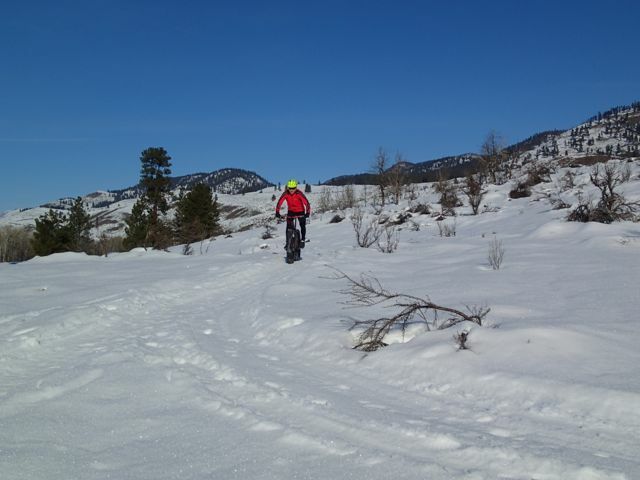 “Single track” groomed by Methow Cycle & Sport. Lloyd’s trail loops. The most fun we had were on the upper trails by Pearrygin Lake. 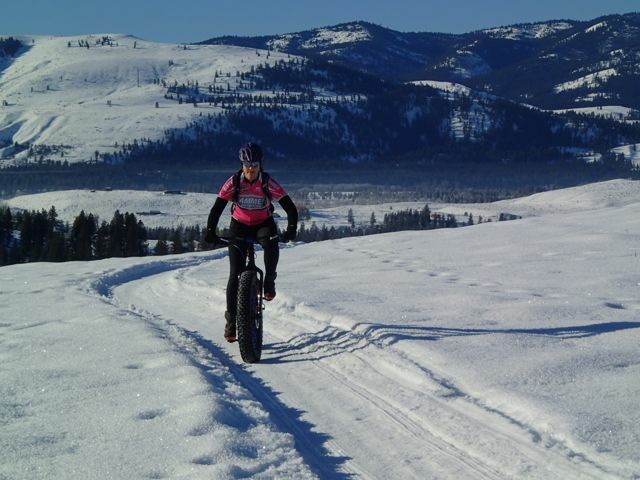 More impressive is the work that the Methow Cycle & Sport shop has achieved. Using both snowmobile and also some other unconventional, man-made implements, they craft and maintain fat bike-only “single track,” little more than 2 feet wide. The terrain is varied: trails meander through open fields, they take interesting courses, snaking up, down, and around natural features and slopes, and some glide along the edges of Pearrygin lake. There’s easily enough trail to get in a 3 hour ride without repeating lines. I was excited to hear from Joe, the shop owner, that he’s planning a big fat bike event next winter including 30 mile and 60 mile race options as well as more leisurely fat bike touring options. Get your fat on! Lucky to ride and also have blue bird days. I kept myself fueled with nibbles from Hammer Nutrition bars. Nice thing about ’em is they stay nice and supple even in the near freezing temps. Cranberry is my favorite. Apple Cinnamon is the runner up. They’re based out of Whitefish, Montana, so I’m sure keeping them edible in the cold was a priority for them! Epilogue: I actually took a spectacular crash on day 1. 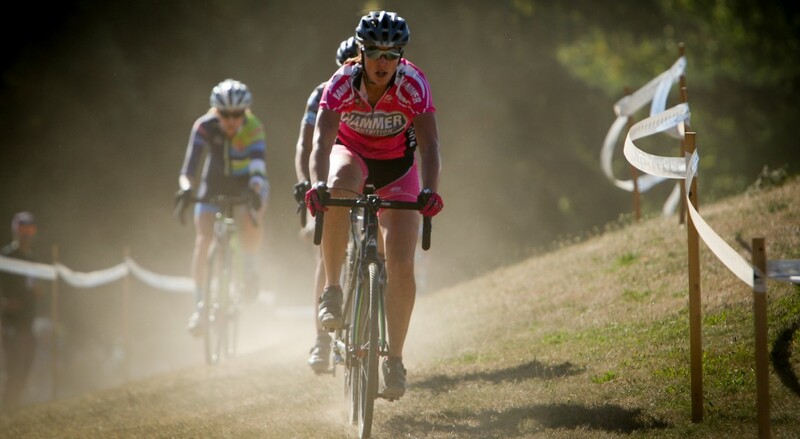 When I crested the top of the very first hill, I began mashing the pedals to pick up speed for the descent ahead. I stood up, yelling, “Weeeee!” while careening down the slope. When the trail began gently bending to the left, I started to lean the bike over in anticipation. But the wide, squishy tires felt unresponsive, and before I knew it, I was off course and plunged my front wheel deep into the snow. I flipped over the bars landing prone in the snow, but not before nailing my ribs into the stem. With Jared’s help, I stood up, but it didn’t feel good. I palpated my ribs and didn’t experience any excruciatingly sharp pains, but the discomfort seemed to emanate into my upper abdomen. I slowly pedaled my way to the car and we headed to the town clinic. I shuffled in slightly stooped, cradling my left ribs. I started to pull out my health insurance card, and they stopped me saying, “oh, we’re booked today and not sure if we can fit you in.” “What do you do if you have a heart attack?” I asked. The old guy behind me in the waiting room piped in, “you drive an hour.” Humph. They allowed me to see a nurse, who palpated my ribs with a touch so light she barely dimpled my skin. Since there wasn’t anything they could do about broken or bruised ribs, I decided to leave. That night I spent on the couch. The cabin we stayed in had a ladder to the mattress in the loft and I couldn’t even make the first step. The next day, I awoke very sore and uncomfortable, and I settled on hanging out in town while Jared went to ride. As he was prepping to go, envious, I said, “lemme just give it a try.” I cautiously pedaled around our icy driveway and determined I’d give it a go. Miraculously, I managed. My recklessness in the first 8 minutes of riding the first day almost completely ruined our vacation. But somehow, I could ride comfortably. It’s funny that riding has been ok. Getting in and out of bed, off the couch, and coughing were really the pits. Luckily, just a week later, I’m nearly recovered. I determined that I lightly bruised my rib and quite significantly impacted my upper ab muscles without actually tearing anything. Lesson learned: I’ll be more careful next time I try something new….